Background: Eiji was a talented athlete and pole vaulter in Japan, until a injury left him unable to compete. 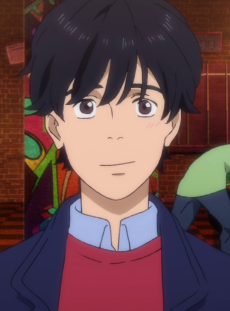 Completely discouraged, faced with losing his sports scholarship, and ridiculed by his former competitors and coaches, Eiji fell into a depressed slump. Then Ibe took him in as his assistant, and the two traveled to New York City, to do a report on youth in street gangs. In New York, Eiji met Ash Lynx. Best 80's Fashion Statement: Hawaiin shirt over a tank top, tied in the front, falling off one shoulder. Inspiration: In an interview, author Akimi Yoshida said that the character design for Eiji was inspired by Japanese actor Nomura Hironobu.